A life of military distinction seemed foreordained for Douglas MacArthur. Born at the Arsenal Barracks in Little Rock, Arkansas, on January 26, 1880, he was the youngest of three sons born to US Army Captain [later three-star Lieutenant General] Arthur MacArthur Jr. (1845-1912), and his wife, the former Mary Pinkney Hardy (1852-1935).2 Raised in the American West as an Army brat, young Doug took readily to physical activity and quickly developed a love of sports. Not over-endowed with natural athletic ability, MacArthur made optimum use of his keen intellect, physical fitness, and an indomitable determination to succeed, molding himself into a first-class schoolboy athlete. At West Texas Military Academy in San Antonio, he was the star of the tennis team and the quarterback of an undefeated football team his senior year. He was also a standout baseball player. Although he lacked power, the lefty-batting MacArthur3 was “a deft bunter, a skilled shortstop,” and the nine’s captain/manager.4 He was also valedictorian of his class and a leader of the cadet corps at the school. Despite these accomplishments and family influence – MacArthur’s father was a distinguished career officer who himself had been awarded the Congressional Medal of Honor for battlefield bravery as a youthful Civil War field commander,5 while his grandfather was a prominent Washington, DC, judge – Douglas did not receive an expected presidential appointment to West Point upon his high-school graduation in 1897. Undiscouraged, he committed himself to a course of rigorous private study and attained admission by competitive examination two years later. In the beginning, life at the United States Military Academy was not easy for Cadet Douglas MacArthur. The prominence of his surname attracted the enmity of envious upperclassmen, while the constant attention of MacArthur’s overprotective mother only made things worse. With her husband dispatched to the Philippines to put down the insurrection led by Emilio Aguinaldo, Pinky MacArthur took up lodgings in a hotel within sight of her beloved Douglas’s billet and was soon a conspicuous presence on campus. As a result, young MacArthur (as well as fellow plebe Ulysses S. Grant III) was targeted for particularly savage hazing during his West Point initiation. The experience, however, ultimately turned to MacArthur’s advantage, as he gained the esteem of the cadet corps when he respectfully but firmly declined to identify his tormentors during ensuing congressional hearings into the death of a classmate subjected to similar treatment.6 Thereafter, his academic brilliance, leadership abilities, and dashing personality made MacArthur a big man on campus at West Point. The 1901 West Point season got off to an auspicious start with drubbings of Hamilton College (14-4), Vermont (16-0), Rutgers (10-1), and Riverview Military Academy (8-4), before Lehigh administered a dose of like medicine, routing the Cadets, 20-6. A 6-6 tie with NYU on May 15 then set the stage for the all-important clash with Navy. On May 17, the Army team, under the supervision of its faculty representative, First Lieutenant Leon B. Kromer, arrived in Baltimore to rest the night before journeying on to Annapolis. At 2:30 the following afternoon, the game began with Navy (its record then standing at 4-2) batting first. As he ran out to his defensive position in left field, MacArthur received a good-natured roasting from a grandstand full of midshipmen who serenaded him with a ditty that ended: “Are you the Governor General or a hobo? Who is the boss of this show – you or Emilio Aguinaldo?”11 With two out in the first, Navy’s James Reed doubled down the left-field line, but MacArthur returned the ball safely to the infield, and the Cadets emerged unscathed when the inning ended with a groundout. Army also went scoreless in its first at-bat, with MacArthur striking out. Navy broke the scoring seal with a tally in the third, but the Cadets promptly responded with a three-run outburst in which MacArthur played a small but vital role. With two men on and no outs, Dauntless Doug coaxed a walk from Navy pitcher Wade Raudenbush to load the bases. The first Army run scored on a fly out to right, with the other runners also tagging up and advancing a base. They kept running when the throw home sailed over the head of the Navy catcher, with MacArthur moving to third on the overthrow. A single by Army shortstop John Herr later plated MacArthur, giving the Cadets a lead they would never relinquish. Although he had another year of athletic eligibility remaining, MacArthur did not go out for the baseball team in 1903. According to biographer William Manchester, MacArthur “gave up baseball in his last year so that he could hit the books harder.”21 But that assessment is somewhat difficult to reconcile with MacArthur’s assumption of the time-consuming job of student manager of the West Point football team that school year. More likely causes of his separation from the diamond include loss of playing time in 1902, the termination of his friend Charles (Irvine) Davis as Army baseball coach at 1902 season’s end, and, perhaps, wounded pride. In any event, the premature end of his baseball team membership did little to dim the luster of MacArthur’s stay at West Point. Valedictorian of his class and first captain of the cadet corps, a brilliant, if at times controversial, military career lay ahead of him. Detailed exposition of MacArthur’s martial exploits is beyond the scope of this profile. Suffice it to say that his military career was meteoric and distinguished: various postings, both abroad and State-side, plus a citation for bravery during a reconnaissance mission to Veracruz, Mexico, as a junior officer; award of the Distinguished Service Cross, the Silver Star, and other citations for battlefield heroics and leadership in France during World War I, with promotion to the rank of one-star brigadier general; postwar appointment as superintendent of West Point; selection for the post of Army chief of staff in 1930, followed by military and civilian assignments in the Philippines; award of the Congressional Medal of Honor for leading the resistance to the Japanese invasion of the Philippines in 1942, followed by appointment as Supreme Allied Commander, Southwest Pacific Theater during World War II; elevation to the rank of five-star general of the army in December 1944; military overseer of Japan following VJ Day, and commander of UN forces in the Korean War until his dismissal by President Harry Truman in April 1951. Following his famous farewell address to Congress (“Old soldiers never die; they just fade away”) shortly thereafter, the General and second wife Jean Faircloth MacArthur22 lived in retirement at the Waldorf Towers in Manhattan. During these often tumultuous times, MacArthur never lost his love of sports. His passion for West Point football and longtime friendship with Black Knights head coach Earl “Red” Blaik23 was common knowledge. Less appreciated is MacArthur’s continued involvement and interest in baseball. As a junior officer stationed at Fort Leavenworth, Kansas, he had played first base and managed the company team.24 Thereafter, his experience on the front lines during World War I convinced MacArthur that baseball and other athletic activities furnished both a tonic and a morale builder for battle-weary troops. Six years after leaving West Point, by-now two-star Major General MacArthur was placed at the head of the American Olympic Committee, charged with preparing the US team for the 1928 Summer Games in Amsterdam. To MacArthur, competing meant winning. “We have not come 3,000 miles just to lose gracefully,” he said upon arrival in Amsterdam.27 Message taken to heart, American athletes went on to capture 24 gold medals, setting 17 Olympic and seven world records in the process. MacArthur maintained his interest in sport to the very end. Indeed, the final photograph taken of him – meeting President Lyndon Johnson while an in-patient at Walter Reed Army Medical Center – showed MacArthur clad in his USMA bathrobe, complete with replica of the varsity A that he had won as a West Point baseball player some 53 years earlier. General of the Army Douglas MacArthur died from acute liver and kidney failure at Walter Reed on April 5, 1964. He was 84. Survivors included second wife, Jean, and only child, Arthur. A gifted military commander blessed with superior intellect and strategic vision, but prone to arrogance and condescension, MacArthur evoked strong emotions. Many admired him, some despised him. 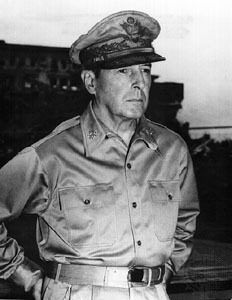 Australian Field Marshal Thomas Blamey reportedly said of MacArthur, “The best and the worst things you have heard about him are both true.”32 But whatever his shortcomings, Douglas MacArthur was passionate about baseball, and took lifelong pride in the varsity letter that he had won as a young West Point outfielder. This biography was reviewed by Len Levin and fact-checked by Warren Corbett. This bio is grounded in an article about MacArthur originally published in SABR's Deadball Era Committee newsletter, The Inside Game, Vol. XIII, No. 4, November 2013. The sources for the instant version of that piece are cited in the endnotes. 1 MacArthur “wore long bathrobes of West Point gray with a huge dark blue A embroidered on the left breast” with such regularity that these “terry towel reminders of athletic glory days” had to be replaced every two years. Gregory Perret, Old Soldiers Never Die: The Life of Douglas MacArthur (New York: Random House, 1966), 39. 2 The other MacArthur children were Arthur III (1876-1923) and Malcolm (1878-1883). 3 As noted by military historian Bob Seals in “Hit ’Em Where They Ain’t: General of the Army Douglas MacArthur and Baseball,” Military History, published online September 24, 2017. By learning to bat from the left side, the right-handed MacArthur was emulating the example of late-nineteenth-century stars like John Montgomery Ward, John McGraw, and Billy Hamilton, all undersized but brainy and fleet afoot like MacArthur. 4 As per William Manchester, American Caesar: Douglas MacArthur, 1880-1964 (New York: McGraw Hill, 1978), 45. 5 The MacArthurs and Rough Rider Teddy and his World War II-decorated son Theodore Roosevelt Jr. are the only fathers and sons to be accorded the Medal of Honor. 6 Internal proceedings conducted by the War Department led to the dismissal of five West Point upperclassmen and the curtailment of overly physical hazing rituals. 7 In 1868, a group of summer-cruising Midshipmen had apparently engaged a Cadet nine in an informal baseball game. See John Crane and John Kieley, West Point (New York: McGraw Hill, 1947), 153. But West Point baseball records commence in 1890 when the self-coached Cadets posted a 2-0-1 log against local competition. 8 Report of the Army Officers’ Athletic Association for the Year 1901, 22. 9 According to his son, Lt. Col. Charles I. Davis Jr., USAF, retired, Charles Davis adopted the pseudonym Irvine so as not to be seen as trading upon the renown of his brother George. Letter of Cohoes, New York, town historian Walter Lipka to the writer, December 11, 2000. Cohoes is the home town of the Davis clan and located about 110 miles north of West Point. 10 Frazier Hunt, The Untold Story of Douglas MacArthur (New York: Devin Adair, 1954), 30. 11 As recalled by MacArthur himself in Reminiscences (New York: McGraw Hill, 1964), 26. 12 For a fuller account of the contest, complete with box score, see Mike Huber and Jack Picciuto, “The First Army-Navy Baseball Game,” Base Ball: A Journal of the Early Game, Vol. 1, No. 1, Spring 2007: 96-102. 14 1901 AOAA Annual Report, 24. 15 The Cadets posted a .300+ team batting average that season. The .571 fielding average assigned to MacArthur by the 1901 Annual Report is unrealistically abysmal and presumed to be an uncaught typographical error by the writer. Still, team captain Abbot described MacArthur’s defensive play as “barely adequate.” Hunt, 30. Forty years after the fact, however, Coach Charles Davis (Irvine) provided a wholly different assessment, informing an inquiring reporter that “General MacArthur never made a single error in two years as an outfielder” under Davis’s tutelage, as per an unidentified circa 1944 newspaper article provided to Cohoes town historian Lipka by Charles I. Davis Jr.
16 From World War I battlefield trenches to the tent where the Inchon Landing was planned in 1950, MacArthur frequently presented himself to subordinates in sweaters or bathrobes adorned with his varsity A. Later in retirement at the Waldorf Towers in Manhattan, MacArthur would greet visitors clad in similar attire. 17 See the Army-Navy box score published in the Washington Post, May 18, 1902. 18 1902 AOAA Report, 33. 20 As recalled by Coach Charles (Irvine) Davis in the unidentified newspaper article cited in note 15, above. 22 MacArthur’s first marriage, to divorced socialite Louise Cromwell Brooks, ended in divorce in 1929. He married Jean Faircloth in 1937. The couple’s only child, son Arthur MacArthur IV, was born in Manila in February 1938. 23 Blaik, a West Point cadet during the time that MacArthur was USMA superintendent, served as head football coach at Army from 1941 to 1958. During that time, his Army elevens went 121-32-10, and were national collegiate champions three years running (1944-1945-1946). Blaik was inducted into the College Football Hall of Fame in 1964. 25 As per Manchester, 123. 27 According to John A. Lucas, “USOC President Douglas MacArthur and His Olympic Moment,” Olympika: The International Journal of Olympic Studies, Vol. 111, 1994: 111. 30 As per the Associated Press wire report published in the (Little Rock) Arkansas Traveler, Milwaukee Sentinel, and Riverside (California) Independent-Enterprise, May 27, 1951. See also, Louis Effratt, “MacArthur Gets Lifetime Pass to Ebbets Field,” New York Times, May 27, 1951. 31 Although his interest in the game was deep and lifelong, when it came to going to the ballpark, MacArthur was known to arrive late and leave early. 32 Wikipedia, “Douglas MacArthur,” citing John Hetherington, Blamey, Controversial Soldier: A Biography of Field Marshal Sir Thomas Blamey (Canberra, Australia: Australian War Memorial, 1973).